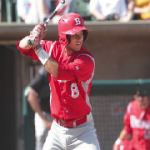 The Bradley baseball team had a dramatic finish to avoid being swept last weekend. The Braves lost their first two games to Evansville before a late-inning comeback victory Sunday. The Braves found themselves down 5-4 heading into the 8th inning, but that was before sophomore outfielder Max Murphy stepped up to the plate. 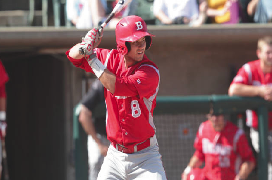 Murphy’s home run tied the game at 5 for Bradley before the team took a commanding 8-5 lead off of a double by freshman outfielder Brady Wilkin and a score by freshman second baseman Nolan Sponsler on a fielding error. The weekend did include two losses and Murphy said some of that has to do with the inconsistency of the pitching staff. Murphy said that errors and a lack of timely hitting have hurt the team as well. In terms of leadership, Murphy said he has noticed a change in his place on the team. As far as the Braves’ attempts to improve, Murphy said they’re working on things, and hopefully the team can get their record up and make a strong tournament run. Once Bradley is in, Murphy thinks they have a shot at a nice postseason run. “If we just bring it all together and start doing the little things right, I think we can win the [Missouri Valley Conference] tournament and make it to the NCAA,” Murphy said. The Braves beat Eureka 20-0 Tuesday with 20 hits coming from 13 different players. They will travel to Creighton for a three game series this weekend.